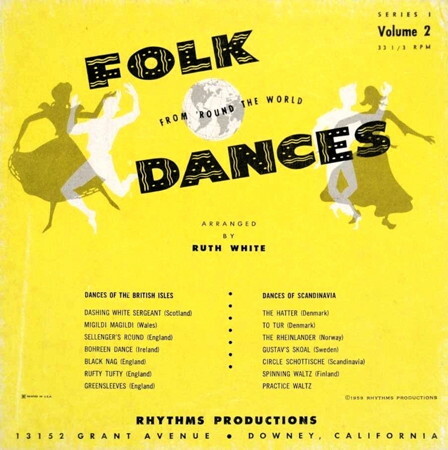 Folk Dances From 'Round The World, vol.1 (33rpm phonograph record RW57). White, Ruth, arr. Los Angeles, Cal. : Rhythms Productions, 19? Folk dancing was originally brought to the United States by the immigrants of the various ethnic groups. Dances were transplanted to this new soil and danced by the people. Later, folk dancing came to be associated with interest groups. They performed them at festivals where spectators watched passively. Between 1930 and 1940 there was a movement during which such groups as the Folk Festival Council of New York attempted to popularize folk dancing as a recreational activity. Finally in 1940 at the New York World's Fair, thousands of people tried simple folk dances at the American Common. With all this activity, the growth of folk dance societies was rapid throughout the country. The interest has mounted to the present time. A diversity of people, those of every age, interest and background are participating. Folk dancing has now become one of America's leading recreational activities, and as such, it appears to mirror the great composite of our cultures.